This hotel offers a wide range of rooms to suit their taste and budget. With 200 rooms to choose from, including Superior, Executive, Deluxe, Connecting Rooms and Suites for uncompromising indulgence. Room service is available round-the-clock and offers an extensive variety of food selections and beverages. Luxurious room with en-suite bathroom and range of amenities to match, well appointed with modern facilities. Luxurious and spacious room with en-suite bathroom and range of amenities to match, well appointed with modern facilities. Elegant and spacious room tastefully appointed with guest comforts and modern facilities. Large suite with en-suite bathroom, an extra space for seating and dining. Special touches include fruit platter, well stocked refreshment centre, local newspaper & upgraded bathroom amenities. Very large suite with en-suite bathroom and elegant decor, an extra space for seating and dining. Special touches include fruit platter, well stocked refreshment centre, local newspaper & upgraded bathroom amenities. Two spacious rooms with en-suite bathroom in each room connected to each other, ideally designed for families, well appointed with modern facilities. This hotel's wide choice of dining options will surely lift your spirits! The restaurants representing cuisine from across the globe offer you plenty of food for thought. There's always a wide variety of delectable delights to be enjoyed in comfortable and luxurious settings in Deira Dubai. Be it Continental, Mediterranean or Asian cuisine, the efficient and courteous staff will indulge you with superb service. So whether it's a business lunch or family meals, enjoying the best in food and drinks is the norm at Flora Grand Hotel in Deira Dubai. Al Nakheel is an oasis of tranquility and the perfect place to hang out for a wide range of hot refreshing beverages & a la carte menu of exquisite pastries and sandwiches. Al Nakheel Coffee Shop is situated at the ground floor of the hotel. The perfect venue for your meetings in Dubai. 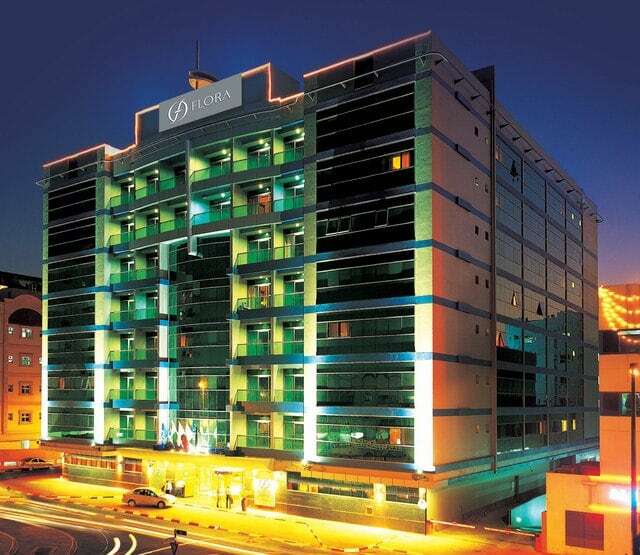 Flora Grand hotel offers an outstanding set of facilities for your upcoming events in Dubai. From our small yet comfortable Al Riqqa Boardroom for 14 attendees, to the Flora Grand Ballroom which accommodates up to 225 guests, Flora Grand Hotel is the smartest choice for your meetings in Dubai. Why choose Flora Grand Hotel Meetings And Event Space? This hotel have a wonderful range of massage treatments including Swedish Massage, Hot Stone massage, Indian massage. The superb facilities include swimming pool, steam & sauna rooms and life fitness gymasium. Take your body on a journey of transformation as you enter the serene and soothing haven of the newly renovated Al Reem Cardio Theater. Let the healing hands of trained therapists ease away the stress of hectic urban life. Energise yourself at the modern fitness centre that features state of the art equipment. A session at The Flora Grand Spa & Al Reem Cardio Theater promises to leave you refreshed and rejuvenated. This hotel also house a beauty salon offering expert care in skin, hair and nails for men and women.